In a large nonstick skillet, heat the EVOO, 1 turn of the pan, over medium heat. Add the turkey patties and cook, turning once, for 12 minutes. 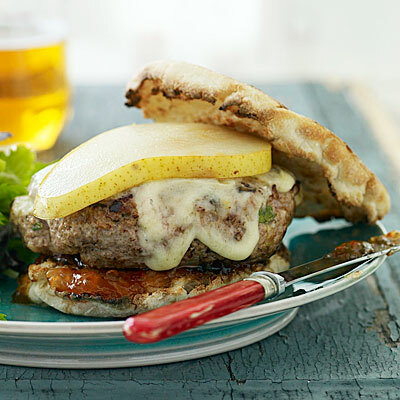 Top with the cheese and pear slices, tent the pan with foil and cook until the cheese is melted, 2 minutes. Notes & Comments: This was very quick to make – I got home late and wanted to throw something together quickly. It was a very easy recipe to follow as well. I did add some breadcrumbs to the turkey mixture because our ground turkey was very soft when mixing everything together – the breadcrumbs allow the meat to stick to itself when cooking and not fall apart when you turn them. Just be careful to not add too much or you’ll dry the burger out. You’ll also want to watch how much lemon zest you add to the mixture as well – I added the zest of one large lemon and BIL commented that it was a little too lemony for his taste. Jason & I liked it as is though. I did not use hot pepper jelly or jalapeno jelly because I didn’t know where to find it, I didn’t know if we would like it and I didn’t know when I would use it again so I didn’t see the point in buying it. It tasted great without it though!